What a fortnight it has been. We have plumbed new depths in animus and acrimony. Not a day goes by without a shrieking melee, either at a press conference or on the streets. The "Reform Spring" has very quickly faded into a fruit-salad autumn, with mangoes and bananas flying around in a new politics of whistle-blowing. Ever since he won the "Emergent Leadership" category of the Ramon Magsaysay Awards in 2006, Arvind Kejriwal has been emerging, and how. Television is the great leveller of this century, and news is well and truly broken. Kejriwal has taken on the business transactions of Robert Vadra, who happens to be the son-in-law of the President of the Congress Party, as his first "direct action" campaign. He spread his net after that, to Salman Khurshid and Nitin Gadkari. More is sure to follow. Where will all this lead? Will any powder be left dry in the campaign for the next Lok Sabha? The sound and fury will go on, and we do not know now how many of these gladiators will be left bloodied but standing when the elections take place. Vadra was a favoured business associate of DLF Limited, India's largest real-estate company. Assistant Editor Manu Kaushik and Senior Editor Sanjiv Shankaran describe the problems DLF faces - even without the opprobrium of the Vadra affair. DLF has been the most artful in acquiring its land bank and leveraging its properties to get where it is, and setting up hundreds of 'partnerships' and project-specific baby DLFs is par for the course. Incidentally, DLF has lost 10 per cent in market capitalisation over the past year and slipped from No. 35 to No. 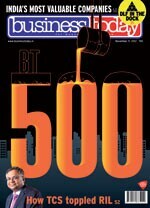 40 on this magazine's annual honours list of India's most valuable companies, the BT500. This year, after a long spell at the top of the heap, Reliance Industries was pipped to the No.1 position on the BT500 ranking by Tata Consultancy Services. TCS's average market capitalisation in April-September 2012 rose by 12 per cent, compared with a year earlier, while RIL's fell by 16 per cent. It is not surprising that TCS, the quiet giant, has jumped from the No.4 rank last year. Its business model, its management style, and its laser-like obsession with growth have all made TCS what it is, and in an unusually relaxed and candid interview, CEO and Managing Director N. Chandrasekaran, a keen marathoner, talks about the company's customer focus, and about his low-key but staminafilled run to the top. For 27 years, TCS was a division of Tata Sons, and set out as an independent entity only in 1995, a child of the revolution that swept through the information-technology field. Today it employs 254,076 people (that's about the size of a goodsized town) in 42 countries. Of course, market-cap rankings are subject to the tempests and temper of the market, and when we last checked, RIL had been ahead of TCS in market capitalisation on every trading day since September 17 until October 19. Both companies are jostling in the profit-making queue. TCS's net profit in the June-September quarter rose 44 per cent to Rs 3,512 crore, while RIL's actually fell by 5.7 per cent to Rs 5,376 crore. You can see some explanation for why TCS has toppled RIL, which ruled imperiously at the top of the BT500 rankings for nine consecutive years. This is the 21st year this magazine has run its trademark barometer of corporate well-being, and you will get a fascinating snapshot of the past five years if you go to businesstoday.in/bt500. This year's huge smorgasbord of very readable stories was supervised by master chef Suman Layak, aided by the number-crunching prowess (not surprisingly the name of the CMIE database we use) of Jyotindra Dubey and Niti Kiran, and the reporting skills of our very inspired band of reporters. Finally, do not miss Anand Adhikari's very enterprising investigation of how foreign private-equity firms are setting up, or acquiring controlling stakes, in Indian non-banking financial companies (NBFCs), to lend money to high-risk sectors like real estate (see DLF above). What goes around comes around.